My costume of Hallis Saper, a character from the novel Starfighters of Adumar. Here I'm lucky enough to pose with the creator of that character and author of Adumar, Aaron Allston, at Celebration VI. Thanks to LordGoldenArrow for the photo. My go-to costume: X-wing pilot. The above picture is from Celebration III and is my favorite photo from all of my costuming activities. 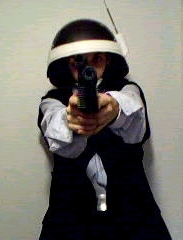 My Corellian Security (CorSec) officer costume. My Rebel Fleet Trooper costume. I need an updated picture with my DH-17 blaster. My New Republic Dress Uniform costume. Below is additional information on each of my costumes. Feel free to e-mail me any questions about them. My e-mail address is at the bottom of this page. Thanks to LordGoldenArrow for many of these pictures. 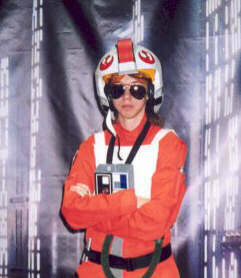 I made the first version of my X-wing pilot costume in 2001. Since then I've made a new flak vest, bought a new helmet, and added or improved things as needed. My flight suit is an orange work jumpsuit with a modified collar and added pockets. My flight gloves were purchased from Museum Replicas. Boots are German Jackboots. My chestbox was a kit from Richie's Armor that I put together and painted. Richie's Armor assembled and painted my helmet, and they did an amazing job on it. I made the flak vest myself, using old suitcase latches for the side buckles. The comm pad, data rods, and ejection harness belt buckle I purchased pre-made. My flares are wooden dowels. This is the outfit that got me into costuming, and it remains my favorite and most-used costume to this day. 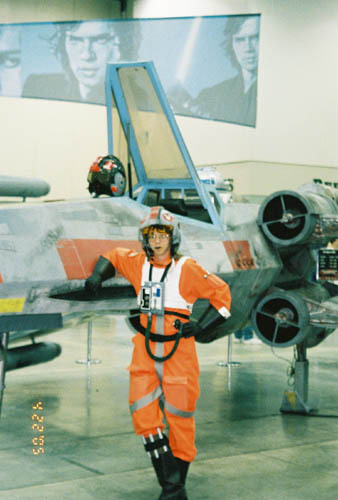 The Rebel Fleet Trooper was my second costume, made in the early 2002 timeframe. All of it was bought pre-made or modified from off-the-shelf clothing, such as the vest. The boots are German Jackboots. This is the costume I wear when I don't want to deal with a lot of gear. 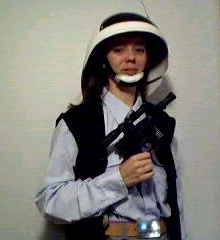 I need a decent picture of my full outfit with my DH-17 blaster. I've only worn this costume once or twice, and the picture above is the only one I have uploaded. I have a tutorial posted here with reference pictures from the X-wing comics and how I did some of the steps. I need to redo this costume before I wear it for an event again. Hallis Saper is a character in my favorite Star Wars novel Starfighters of Adumar. She's a holodocumentarian for the New Republic who uses a silver 3PO head called Whitecap to record material for her holodocumentaries. Whitecap is attached to her shoulder, making it appear as if she has two heads, a fact that the Red Flight pilots continuously joke about while they work with her on their mission. I made my Hallis costume for Celebration VI in 2012, and though it was definitely a challenge, I'm very proud of how it turned out. Some people even recognized it, which totally made my day. I used a regular brown jumpsuit and added more pockets, some writing utensils, and a New Republic patch. I had a few military pouches hanging on my belt and wore generic brown work boots.The black leather fingerless gloves weren't mentioned in the book but seemed to fit. I got some Humvee Motorcycle goggles and made the lenses as dark as I could with spray-on tint for plastic model kits. It's not visible in the photos, but my hair is braided. Whitecap was the hardest part. He's a latex C-3PO mask spray-painted silver and mounted on a styrofoam mannequin head with small outdoor reflectors for eyes. He sits on my shoulder by using a PVC bracket that goes down part of my back and is held in place by a harness underneath my jumpsuit. Whitecap can be easily removed from the bracket and put back on. I'm also very grateful to Tosche Station for including my Hallis costume in their Cosplay Week feature shortly after CVI. How cool is that? A good friend and I teamed up to make CorSec Officer costumes for Celebration VI in 2012. There are several different visual depictions of the CorSec uniform in source materials, but the one we chose to do was from the X-wing comic "Family Ties" which features Corran Horn and Iella Wessiri (pictured lower left). The pants are off-the-shelf slacks. The boots and gloves are the same ones I use for my X-wing pilot costume. As per the comic, we have batons and handcuffs on our belts. We also have a "CorSec" nametag on our vests. My friend made the fitted holster and belt out of leather and dyed it black. I wasn't optimistic about finding that type of collared shirt in that particular orange color or finding a grey and black vest in that style. And thus began my attempt to teach myself to sew from patterns. The orange is a long-sleeved "jacket" with an upright collar and a partially zippered front. The vest is from a pattern for a dress shirt that had the correct style in the front with the lapels and the off-center buttons, I only had to take off the sleeves to make a vest and put the black in the appropriate areas. Overall it came out better than I expected for my inexperience. I've learned a bit more since then and would like to redo the orange jacket and grey vest to fix some of the problem areas. The worldwide organization for Rebel and "good guy" costumers. Their message boards contain a lot of great information for putting together costumes. This is the site for Imperial costumers. They also have a message board available. The Florida Garrison's site is here. The source of my X-wing pilot helmet and chestbox. They do outstanding work. A good site with tutorials and tips. This page last updated February 17, 2013.